Why read Catch-22 when the original on which Joseph Heller fashioned his memorable work is readily available? Catch-22 is, of course, quite unavoidable and rightly so. It is, however, outgunned by The Good Soldier Švejk. Indeed, Mr Heller readily admitted that Catch-22 would never have been written were it not for his discovery of that most endearing Švejk. Joining the army of the Austro-Hungarian Empire at the outbreak of the war in 1914 as a volunteer, Švejk causes general mayhem and consternation by sticking to the rules, promptly – and literally – following all orders given. A most likeable simpleton, Švejk is both unsuspecting and trusting – and without an evil bone in his body. At times, he is surprisingly wise too – often dispensing unsolicited advice with perfect timing. A dog-rustler in civilian life – catching mongrels and selling them after a brush-up as fully pedigreed purebreds – and used to stumbling from one Prague in to another following the instigations of his metabolism, Švejk easily adapts to life in the (lower) ranks of the imperial army as it mobilises to face the Russian juggernaut. Though extremely diligent in serving all officers he meets – or gets sold to – Švejk soon lands in the brig, gets accused of high treason, and is charged with desertion. He, however, undergoes all travails in the best of spirits, reasoning that the powers that be must know best. Švejk thus brilliantly exposes the monumental ineptitude of those draped with authority. Jaroslav Hašek, a bohemian journalist, anarchist, and reluctant soldier, was unable to finish his satirical novel: he passed away, aged 39, in 1923. Hašek had originally intended for The Good Soldier Švejk to comprise no less than six volumes. Upon his death, only three had been completed and a fourth was in the works. A posthumous fifth volume – Švejk in Russian Captivity and Revolution, edited by journalist Karel Vanĕk at the request of Hašek’s publisher – simply fell flat. Hašek penned fragments of the fifth tome while serving on the staff of the Czechoslovan, a newspaper published in Kiev for the Czech Legions fighting with the Entente powers, after he was captured by the Russian Army. There is some indication that Hašek may actually have defected to the enemy. In any case, the scraps of the fifth Švejk instalment are permeated by a profound hatred for the Habsburg Monarchy which strangles the humour. 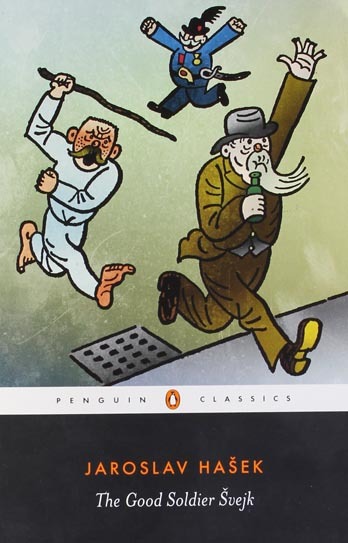 Still, Švejk springs eternal. The good soldier also gave rise to Schweikology – the art of subversion by idiocy – and a number of derived expressions such as Schweikism (a military absurdity), to Schweik (to loaf without an ulterior purpose other than to get by with minimal effort), and a Schweik (an unlucky and simple-minded yet resourceful little man oppressed by higher authority). Thus Spake Švejk.